You’re never too old for a wickedly good Halloween party. Whether you want to want to go chic and spicy, creepy and scary or just downright fun, killing it at your next Halloween party is easy. Just follow these 3 steps and treat your guests to the event of a lifetime. It all starts with a theme. Inspiration for an epic Halloween party is all around you. Pop culture is full of fun, on-trend ideas. Choose movies or TV shows, books, decades, or your favorite music. Go a little more generic with a Vampire’s Ball or a superhero party. Or dream up your own twisted theme, like zombie brides or dead celebs. Whatever you choose, have fun and go all in! The more you buy into your theme, the more your guests will embrace it and bring it to life. So now that you have a killer theme, it’s time to bring it to life. Search Pinterest or Google for ideas on how to use your space to transport your guests to another place and time. Be creative! Find DIY projects and easy ways to repurpose household items into great props for your theme. If your space has multiple rooms, give each one its own distinct character. Create a playlist (streaming platforms like Spotify are free and easy) that gets your guests in the mood. Remember, this is Halloween… randomly placed bowls of candy will never go out of style. You’ve found the perfect theme and brought it to life with some unbelievably creative decor… now tie the whole together with the perfect craft menu. Remember that your theme should run throughout every aspect of your party. Basic apps and drinks simply won’t do. If your movie, TV or book theme featured a famous scene involving food or drink, recreate it! Broader themed parties allow for a lot of room for creativity and fun. Remember that Vampire’s Ball? Try blood orange margaritas. Have fun with flavors, colors, textures and trends. This is one of the few times its ok for guests to play with their food! 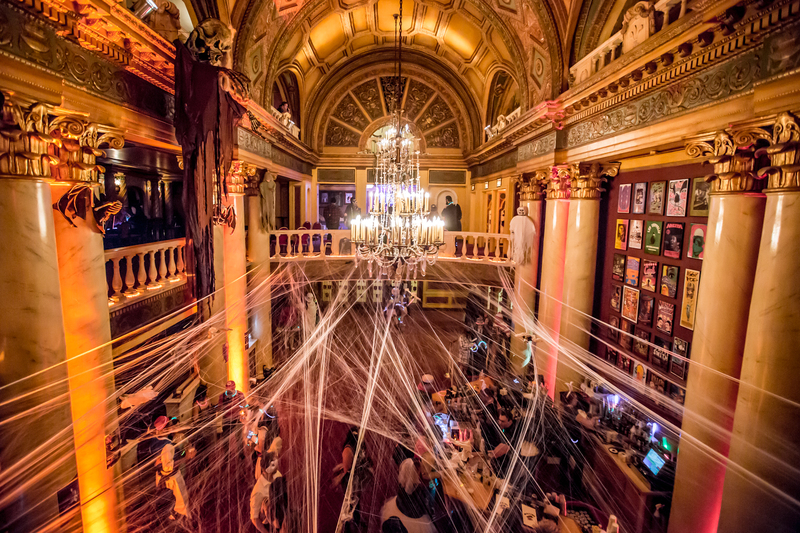 With 40+ locations across the U.S., you’re never far from a legendary Halloween at a Live Nation Special Events venue. If you can dream it, we can theme it. Our private event planners will work with you to craft custom décor and specialty food & beverage menus that will make your Halloween event a full-on experience. THRILL your clients or friends today and book the most hellishly happening Halloween party to date!